Join FMCT members as they enjoy exclusive access to the Mayfield Recreation Complex pool. There will be a swim instructor (Matthew Poole) providing the workouts and available on deck during all sessions. Optional Video Analysis is included with a full session pass. Otherwise available for $10 per video for members, $25 for non members. Must provide one week notice for the Video Analysis requests. Payment for full session sign-up is due by October 31. Can pay in full or in two $100 installments with post-dated cheques (Nov 1st and Feb 1st). You can contact us to discuss other payment plans. Please select the full payment option in the shop and choose cheque or cash if you wish to use a payment plan. Join in with the RMC Fitness group in a fun and upbeat SPIN session. Each session consists of 2h workout focusing on pedaling technique and threshold efforts using your own bike and trainer or one of the 8 spin bikes available. The class will be led by Rob McCue, spin certified instructor and NCCP coach. All are welcome to attend these workouts. All participants must download and fill in the following forms: Registration, Waiver and PAR-Q and contact Rob at bigringfitness@yahoo.com to reserve their spot. Ad-hoc runs are published by our members via our Facebook group. Join in and have fun! 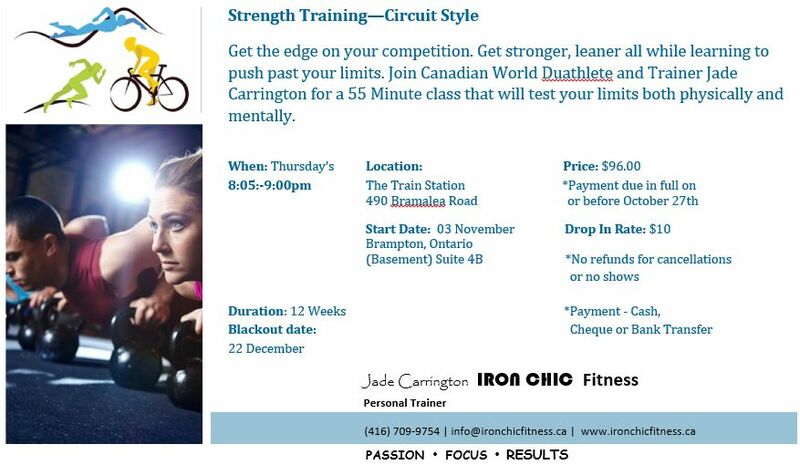 Join Jade Carrington from IRON CHIC Fitness, personal trainer and NCCP triathlon coach for a one hour session of strength and fitness conditioning “Circuit Style”. Location: 490 Bramalea Rd., Suite 4B, Brampton. Fully equipped facility in Brampton with showers. Payments are made to Jade Carrington at IRON CHIC Fitness. All participants must download and fill in the PAR-Q form and contact Jade at info@ironchicfitness.ca to reserve their spot.